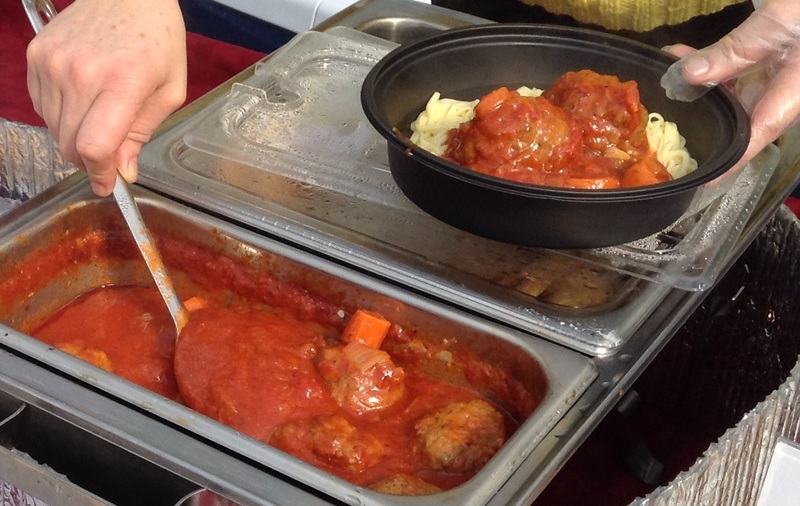 Not many people realize that farmer’s markets exist in the winter, but they do. They are few and far-between, and some don’t operate every week, but you should be able to find a couple within a reasonable distance from your home, if your home is in southern New Hampshire. 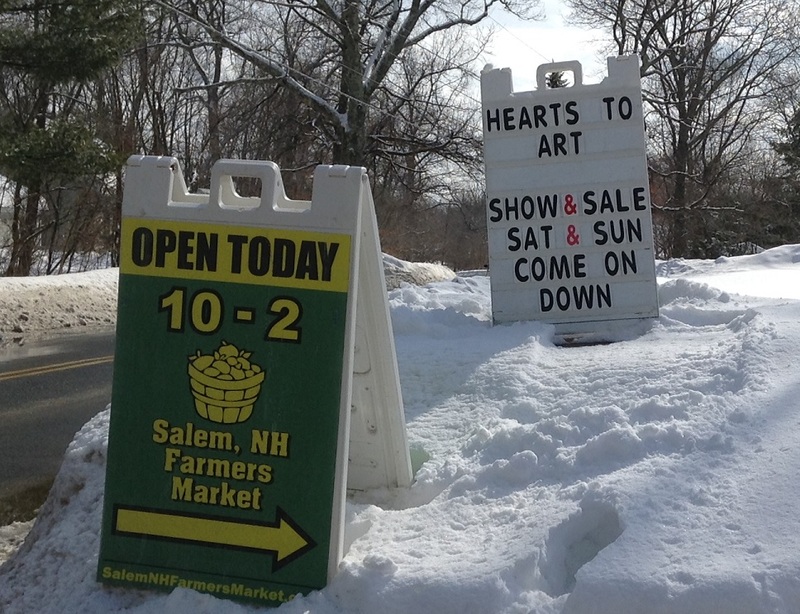 You can find a partial list of New Hampshire winter markets here. Remarkably, what’s missing from that list is the Salem, NH Farmer’s Market, an excellent market that is slightly off the beaten path and hosted at the Lake Street Garden Center. Tucked away within a residential neighborhood, Lake Street is a surprisingly large center that lends outdoor space to the market in the summer and generously lends greenhouse space to the market in winter. A lot of hard work goes into making this market a success, including regular recipe features on WMUR television and social media activity. No cash? A few venders take credit cards, but you can also purchase tokens at the information desk with credit cards or SNAP cards. Sometimes there’s music. Sometimes there’s face painting. Sometimes there’s cooking demos. Because it’s winter, you will find more meat than produce – and there was a good selection to be had this Sunday. I believe all the meat was sold frozen and this is the common way meat is sold at farmer’s markets. Brookford Farm had an amazing display of milk and cheese products, including raw milk, buttermilk, yogurt, kefir, quark, cheddar, brie, blue and feta. Market customers were exchanging empty glass bottles for new filled bottles of milk, keeping the vendor busy ducking out of the greenhouse to his refrigerated truck filled with goodies. They were the only vendor selling dairy, but equally as popular was their grass fed beef products and pasture raised pork and chicken, including maple bacon. Ground beef sold for $10.00 a pound and sausage sold for $12.00 a pound. But that’s not all. They also had a small selection of root vegetables and bags of flour milled from their own wheat, grown GMO-free on their farm in Canterbury, NH — One of the very few growers of wheat in New England! Hurd Farm, from Hampton, NH, raises grass-fed beef, all-natural, pasture-fed chicken and turkey and all-natural heritage breed pork. They were offering several cuts of beef, pork chops and sausage and whole turkeys and chickens. Italian sausage sold for $9.99 a pound and Ground Beef sold at $6.99 a pound. You can find Hurd Farm at several farmer’s markets in Rockingham County and also at the farm on Wednesdays and Fridays, where you will also find fresh eggs and maybe some laying hens for purchase! 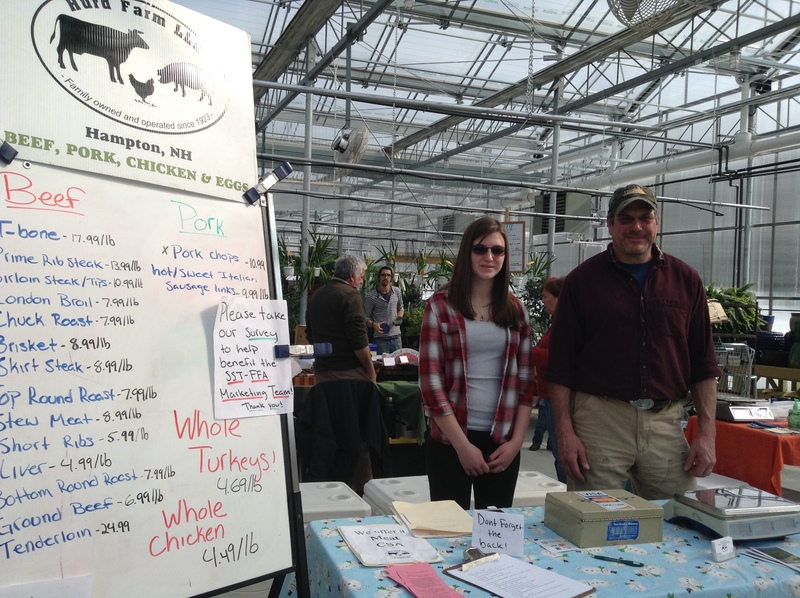 Miner Family Farm, from Merrimack, NH, had the only offering of lamb at the market. They also sold cuts of beef, pork and chicken, plus chicken and duck eggs, along with their own branded selection of dried herbs and spices. Ground beef sold for $7.00 a pound and Italian sausage sold for $6.50 a pound. If you want chicken, Vernon Family Farm has it in all forms – whole birds, butchered, sausage, stock & soup and even organ meat. Sausage sold for $10 a pound. Their Cornish-cross birds are pasture raised with additional organic grain feed on the farm in Newfields, NH. They also sell Oyster and Shiitake mushrooms! The only vendor this past Sunday with an extensive collection of produce was Arrowhead Farm from Newburyport, MA. Besides cold storage staples like potatoes and onions, Arrowhead featured a variety of greens and herbs freshly grown in their solar greenhouses. Arrowhead also uses the Salem Farmer’s Market for some of its CSA (Community Supported Agriculture) pickups, and it has one of the larger selection of CSA options I have seen in the area, so that is worth checking out. A wild blueberry distributor had a booth. 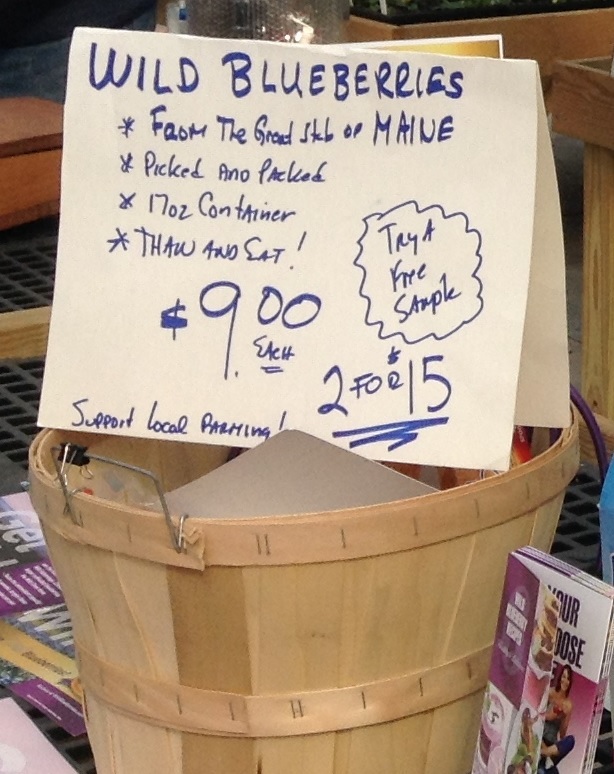 Representing eight family farms in Maine, including Wild Wescogus Berries in Addison, Orcutt Farm in Steuben, and Dan-a-Dew Wild Blueberry Farm in Blue Hill, he was selling 17oz containers of individually quick frozen berries for $9.99. Wild blueberries are smaller than cultivated blueberries but contain twice the antioxidants. And they are delicious. Dried herbs, herbal Teas, and infused honey and oil were available from Wilton, NH’s Bee Fields Farm. Anderson’s Mini-Maples from Deerfield, NH provided the necessary maple syrup products. Finally, every farmer’s market that I visit have local vendors selling their own homemade small-batch foods, which may or may not be sourced from locally grown/raised products and this market is no exception. 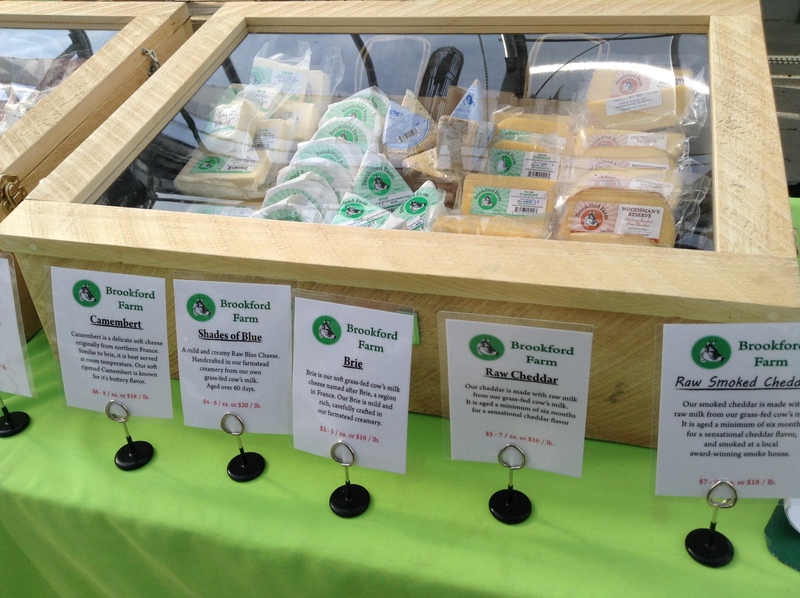 This past Sunday you could pick up organic breads, pancake mixes, mustards, jams and jellies from The Fresh Plate of Amherst. You need to act fast. There was only two loaves of bread left by the time I got there. There was coffee from Salem, NH’s Farmhouse Roasters, chocolate from Salem’s KRM Chocolates and cookies from Windham’s ‘Cuz it’s Good! If you wanted lunch right there, you could grab some Puerto Rican from Kingston, NH’s El Camino or some Ukrainian from East Kingston’s Bucovina Cuisines. Or snack on some organic baked beans from West Hopkinton’s Breakwind Farm (that’s right). 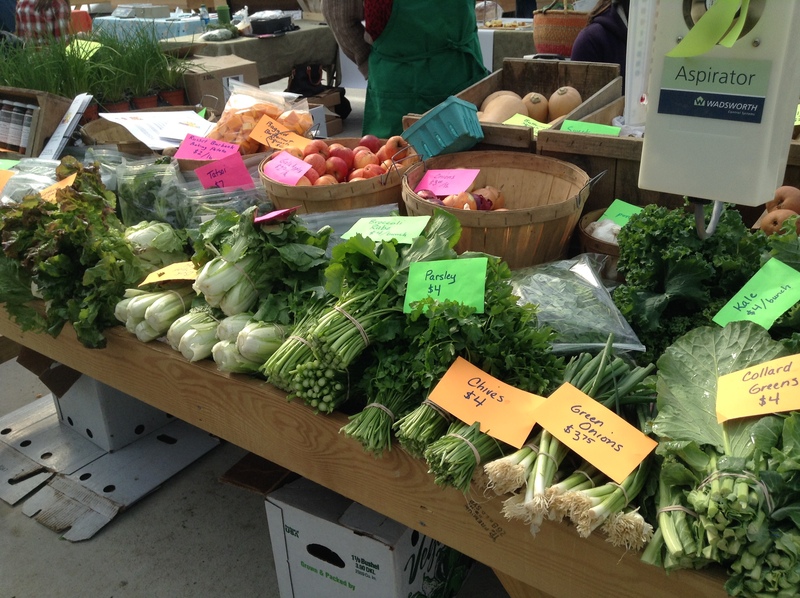 The Salem, NH Farmer’s Market is open every Sunday from 10-2, all year long. I never knew that Salem had a farmers market and this looks like it has a great variety of goods! I will definitely check this one out! Yes, Salem is one of the better markets in the area. Their hard work shows. How did this get posted in the future. It’s still only 11:58 on 2-28-15. I think it has something to do with the time zones. Hello Patricia! My mouth was watering while I read your blog. I have never been to a Farmer’s Market, but now that I have moved to Sacramento, I plan on going. I’m not much of a cook, but grilling up some grass-fed beef sounds like a good idea right about now. Hi, Kellcius! Especially with all the meat offerings at farmers markets these days, and even prepared foods, I think anyone could find something that suits them at any given day. I really like your blog and as a frequenter of Farmer’s Markets, kind of got a chuckle out of one occurring in the snow belt. Looks like a great place to shop and the prices are comparable to those found in San Jose and San Francisco. I look forward to other postings by you. 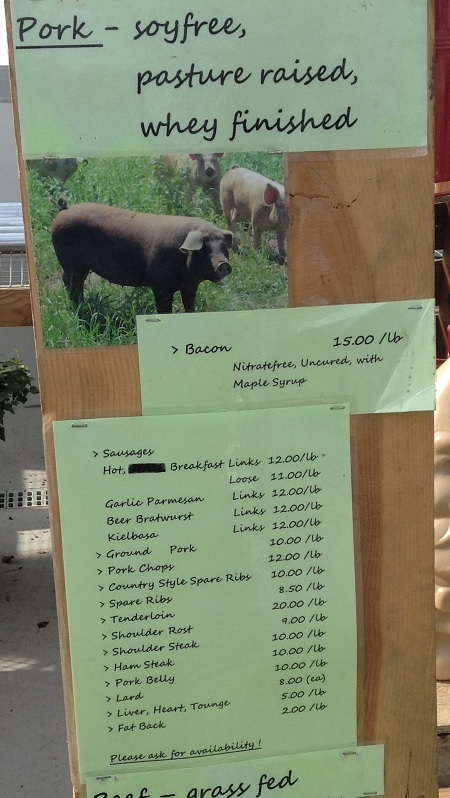 I had no idea that this farmer’s market had so many offerings. Yes! and just think — this is “only” the Winter market. There’s even more in the summer market. Your blog is very informative. Living in Las Vegas, we do not have farmer markets like this! The very few markets that we do have are not that fresh because they have traveled pretty far to get here. I drive 35 miles to Whole Foods every week to try and get the best ingredients like you would receive at a Farmers Market. Great post! Wow, I don’t think I’d drive 35 miles for anything! But yeah, can’t be too many farms in the desert. Thank you so much for your remarks!